We were very excited when we first heard about Bong Joon-Ho's English language debut. 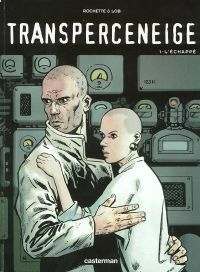 A lose adaptation of Jacques Lob's French graphic novel "Le Transperceniege," the story takes place in a post apocalyptic world where the Earth's surface is coated in a thick layer of frost. From our original coverage: "The story revolves around a train traveling in an endless circle, filled with the remnants of humanity after a devastating war and glaciation. The temperature is -80 degrees outside, but inside is a microcosm of humanity with different political and social structures." Much has happened in the years since the project was first announced. For starters, Chris Evans has signed on to star as one of the survivors and now Variety reports that both Tilda Swinton (We Need to Talk About Kevin) and Jamie Bell (Dear Wendy) are in talks to star in the project now titled Snow Piercer. A great cast, an internationally lauded director and Park Chan-wook (Thirst, Oldboy) producing? This is like dream project in the making for us here at QE. With production scheduled to start in March, I expect we'll be hearing and hopefully seeing more from the film later this year.